I’m still (yes, still) getting organized at home after our vacation. Are you wondering what’s taking me so long?? Well, I decided that it was time to get organized…especially with my photographs. So, I loaded Lightroom (for the first time – btw, I also use Aperture) and ordered yet another external hard drive, as I am determined to really set forth having a “system” now on cataloguing and keeping my photographs organized, backed up and accessible. And, big news, I actually followed the directions on starting a catalogue of my photographs. My photos are now all off of my hard drive, backed up, accessible and I’m ready to return to the blogging universe. Aaaahh, I feel so much calmer – amazing what taking the time to get organized can do for your mental sanity. Now, I’m ready to get back to Meatless Mondays, Vegan Product Shares, Green Tip Tuesdays, Wordless Wednesdays, etc., etc., etc. Thanks for being patient with me! 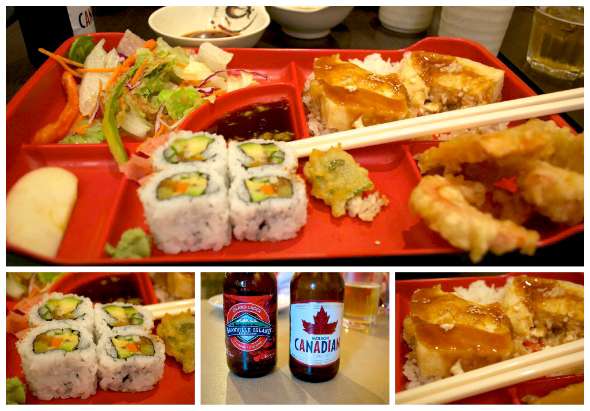 For today, I thought I’d put up a few shots of a couple of meals we ate on our Vancouver/Victoria trip. Sort of a “Meatless Monday” meal inspiration kind of thing. Truly, we had no problem finding vegan (or at least vegetarian) foods to eat on our trip. Every restaurant we ate at was also more than willing to accomodate our vegan diet. In fact, I believe a few of the chefs that we spoke with were excited that we were willing to let them “go for it” with our meal as long as it was animal free – it’s like giving an artist an open canvas to work with. Really, simply asking was all it took at times to get a meal that might have some “chicken” broth in the recipe to be made with only vegetable broth. I truly wish I had taken more photographs of all the delicious meals we had. I was usually pretty hungry by the time we stopped to eat and then, when the food was in front of us, all I could think about was devouring it. Even finding a quick and healthy breakfast was easy on this trip. You can be sure I have a ton more photos to share. I’ll try to work them in among my other blog posts…now that I’m organized YAHOO!! So, have you had any issues finding “healthy” and/or vegan food on your vacations? Any tips to share? I’d love to hear them. Hope you’re all enjoying your “Meatless Monday”! Next week is the return of the recipes – I have one in the crock pot today that I’ll share should it turn out tasty. Oh my, I am getting hungry checking out this delicious looking food! It sounds like you’ve got things in order with your pictures. I should probably do something similar with mine soon! I’ve enjoyed reading your blog, and awarded you with a Liebster. Keep up with the fantastic blogging! Awww thanks so much!!! You simply made my day!!! Yahoo a Liebster!! Thank, thanks, thanks!! Happy Weekend to you!! They look yummy! I’m terrible about eating healthy when we’re on vacation. I eat a lot of peanut butter.